This new post completes the article “Duterte 'admitted complicity' in Davao killings – WikiLeaks”, written by Rappler reporter and part-time cyberbully Paterno Esmaquel II. "Complete" the article? Yes, because Esmaquel all-too-conveniently forgot to include several important details, details that will make his article fall apart. Esmaquel reported about a 08 May 2009 US Embassy diplomatic cable, which suggests Duterte’s complicity to the legendary vigilante group Davao Death Squad (DDS). "Commission on Human Rights regional director Alberto Sipaco (strictly protect) at a private meeting affirmed that Mayor Duterte knows about the killings and permits them. Recounting a conversation he once had with Duterte, who is his close friend and former fraternity brother, Sipaco said he pleaded with the Mayor to stop vigilante killings and support other methods to reduce crime, like rehabilitation programs for offenders." ThinkingPinoy looked for the diplomatic cable that Esmaquel quoted. It was entitled “DAVAO OFFICIALS DENY VIGILANTE KILLINGS, BUT HUMAN RIGHTS COMMISSION BLAMES MAYOR”. The quoted paragraph above was taken from the fifth point in the cable. At first glance, the article’s premise already sounds problematic because it basically states Esmaquel allegedly heard it from Wikileaks who allegedly heard it from Kenney who allegedly heard it from Sipaco who allegedly heard it from Duterte. Basically, Esmaquel gave us double hearsay evidence at best, quadruple hearsay at worst. In as far as the validity of evidence, this situation is no different from the “Sampalan sa BPI Julia Vargas” incident, where disgraced Senator Antonio Trillanes allegedly heard something from a Joseph de Mesa who heard something from an alleged AMLC insider. These claims will not be admissible in court. One of the Rappler article commenters already pointed this out. In reply to that comment, another person suggested that a proper investigating body should verify this information from Wikileaks. The diplomatic cable shows it was prepared in May 2009, and it said it was being written during CHR’s ongoing investigation on DDS. Sipaco, the “witness”, is actually CHR Region XI Director. Now, who was CHR Chairperson during those times? Senator Leila de Lima [GMA]. Sipaco’s allegations in the leaked diplomatic cables is actually part of set of claims that led to CHR’s 2009 investigation into Duterte’s alleged involved with the Davao Death Squad. Yes, Sipaco’s claims were already investigated by no less than Senator Leila de Lima herself, while the latter was still headed by the Commission on Human Rights. De Lima actually spearheaded this investigation, so actively that she even broke our country’s laws in a desperate bid to prove her point. On 16 July 2009, two months after the publication of the diplomatic cable, Panabo City inmate Jonathan Balo sued De Lima, House Speaker Prospero Nograles and six other people for allegedly taking him out of his detention cell without a court order [Star]. Balo didn’t want to leave his cell in fear of being summarily executed. Nevertheless, Balo was illegally taken out of his cell and told he’ll be taken to a police station to identify a suspect. Upon reaching the police station, he was transferred to another vehicle and brought to the Laud quarry site in Ma-a, Davao City. There, he was forced to admit being a DDS member. Balo was brought to the Laud quarry site at a time when a CHR-led team was searching the area for the supposed remains of victims of the DDS, a vigilante group. This recommendation basically instructs three government agencies – Ombudsman, NBI, and DOJ – to take action. 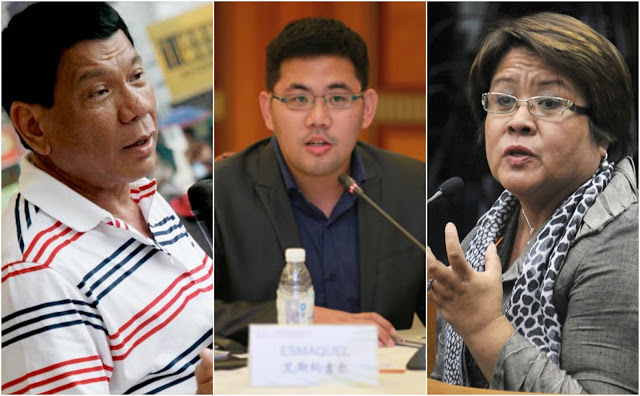 Interestingly, by the time the CHR issued its recommendations, De Lima was already Justice Secretary, after having been appointed as such as soon as President Aquino took his 2010 oath of office [GMA]. Thus, de Lima actually had control over both the Department of Justice and all its agencies, including the National Bureau of Investigation. That is, de Lima’s DOJ appointment after her CHR chairmanship placed her in the best position to see the DDS issue resolved once and for all. NBI and DOJ’s effort reached a dead end so there’s only one agency left to talk about: the Ombudsman. The Ombudsman ordered the investigation of the DDS issue closed and terminated for lack of evidence, the same reason cited by De Lima herself. Yes, the Ombudsman cited insufficient evidence too. What’s more interesting, however, is that Sipaco was quoted in the document. Yes, Sipaco said that himself. Yes, the same Sipaco who allegedly told Ambassador Kenney that Duterte admitted involvement in DDS. Yes, the same Sipaco cited in Wikileaks. Sipaco said DDS was “chismis” (gossip), the same Sipaco who released the statement that was the central premise of Paterno Esmaquel’s piece. With that, Esmaquel’s Rappler article falls apart, just like most of what he has written before. Esmaquel basically tells us that Wikileaks suggest Duterte’s complicity with DDS. However, Wikileaks’ ultimate source was Sipaco, who dismissed DDS claims as gossip AFTER the publication of the leaked cable. Now, some camps will argue that Sipaco could’ve been pressured by Duterte, but remember that Sipaco was under the protection of Liberal Party-led Malacañang from mid-2010 to mid-2016, and that the Liberal Party has repeatedly tried (and failed) to destroy Duterte during the campaign period [TP: Destroy Duterte]. A lowly city mayor can scare off someone fully backed by the Office of the President? No, that claim shall not fly. Still, self-confessed killer Edgar Matobato, who was presented by De Lima, recently testified before the Senate that Duterte instructed the DDS to execute people. The problem, however, is that Matobato has been proven to be a pathological liar. FIRST: Matobato confessed to killing certain Sali Makdum, whom Matobato claimed was an international terrorist targeted by DDS [GMA]. As it turns out, Makdum is Matobato’s relative by marriage who wanted to buy land from Matobato [CNN]. Matobato was previously engaged in buying and selling of land. SECOND: Matobato said DDS killed billionaire Richard King inside a McDonald’s restaurant. The problem, however, is that King’s own family knows he was killed in an office building [Star]. THIRD: Matobato previously claimed to have not executed a sworn affidavit in 2014. As it turns out, he actually did, and the claims in that 2014 affidavit thoroughly contradict Matobato’s claims in the Senate hearings [Star]. On 23 September 2016, Senate Justice Committee Chair Richard Gordon said, "You have to test his credibility, you have to test his memory, you have to test events. And he was changing stories [ABS]." Matobato’s consistencies have also been pointed out by Senators Panfilo Lacson [Star], Manny Pacquiao [GMA], Alan Peter Cayetano [CNN], and Sonny Angara [Inq]. Meanwhile, the only ones who stand by Matobato’s credibility are Senators Leila de Lima [CNN] and Antonio Trillanes [AJ]. De Lima backing Matobato is not a surprise: it was her who sneaked Matobato into the senate hearings to begin with. Her “faith” in Matobato was expected. Trillanes, on the other hand, is the same senator who believed in hearsay when he accused Duterte of corruption during the last weeks of the campaign period, an accusation that he sorely failed to substantiate [TP: BangkoSerye]. So the only two senators backing Matobato is one who harbors a clear conflict of interest, and one who has cried “Wolf!” too many times. In the Rappler article, all Esmaquel did was add to the noise without adding value into the conversation. Esmaquel seriously lacks research skills, a basic skill that’s expected from him, especially since he has a master’s in Journalism and a bachelor’s in Communication, both from the Ateneo.